A further sharp slowdown in emerging market economies is weighing on global activity and trade. At the same time, subdued investment and productivity growth is checking the momentum of the recovery in the advanced economies. 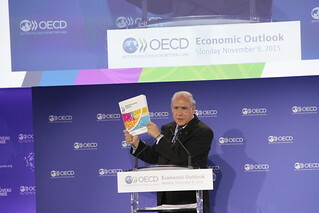 9 November 2015 - Secretary-General Angel Gurría presenting the OECD Economic Outlook, OECD Headquarters, Paris. I would like to share with you the core messages of the OECD’s latest Economic Outlook, before handing over to Álvaro Pereira, Director in the Economics Department, to provide more details. We now expect the global economy to grow by less than 3% in 2015. This is the weakest growth since 2009 and well below the long-run average. This largely reflects further weakness in EMEs, with recessions in Brazil and Russia and the slowdown in China hitting activity in key trading partners. Global trade, which was already growing slowly over the past few years, appears to have stagnated and even declined since late 2014, with the weakness centering increasingly on emerging markets, particularly China. This is deeply concerning as robust trade and global growth go hand in hand. In 2015 global trade growth is expected to grow by a disappointing 2%. Over the past five decades there have been only five other years in which trade growth has been 2% or less, all of which coincided with a marked downturn of global growth. Business investment also remains subdued, rising by an anaemic 3.3% per annum over 2015-16 in OECD economies. And credit remains subpar in many advanced countries, particularly in the euro area. From these weak beginnings, we expect global growth to strengthen gradually and reach 3.6 percent by 2017. However, even this improvement hinges on the continuation of supportive macroeconomic policies, a pick-up in investment, continued low commodity prices and a steady improvement in labour market outcomes in the advanced economies. Between now and 2017, unemployment in OECD countries is expected to fall to 6.3%. But that’s still 39 million people who would be out of work in OECD countries, over 6 million more than before the crisis started. The outlook for EMEs is a particular source of global uncertainty, given their large contribution to global trade and GDP growth in the last few years. Many have been hit by lower commodity prices, some by weak export demand. Many EMEs have also seen a rapid accumulation of corporate debt in recent years. Volatile international capital flows could thus make servicing that debt much more difficult. First, we need to resist and turn back rising protectionism. Trade strengthens competition and investment and revs up the “diffusion machine” – the spread of new technologies throughout the economy – which will ultimately lift productivity. Second, we need to step up structural reform efforts, which have weakened in recent years. And here, I mean the whole range of structural reforms – education, innovation, competition, labour and product market regulation, R&D, taxes, etc. Third, there is scope to adjust public spending towards investment. If done collectively by all countries, if the sector and projects chosen have high multipliers, and if combined with serious structural reforms, stronger public investment can give a boost to growth and employment and not increase the relative debt burden. This Economic Outlook also includes a special chapter on climate change, in the run-up to the COP21 meeting here in Paris. Addressing climate change is critical for long-term economic sustainability and healthy growth. The fragility of economic recovery cannot be an excuse for policy inaction. In fact, there is a range of win-win policies that could support climate-friendly investment and boost global growth and trade! Finally, a word on Europe, which is facing the biggest refugee inflow since World War II. A box in the outlook and a separate policy brief, also released today, look at the economic impact. Given the right policies, asylum-seekers need NOT impose an unmanageable economic burden. Rather the opposite. If the migrants are successfully integrated into European societies, they are likely to benefit the host countries and, over time, turn out to be fiscally net positive. The OECD has been working on the integration of migrants for over 40 years, and we stand ready to support the countries facing this challenge. I now hand over to Álvaro Pereira who will provide you with more details on the Economic Outlook.